Aveeno Active Naturals Skin Relief Calming Lotion with Cooling Action is manufactured by Johnson and Johnson Consumer Products Company. I purchased this product on sale at CVS/Pharmacy for $4.99 in a 7.0 oz. (198g) bottle. If you want to know the truth, I actually got the product for much cheaper than $4.99 and I explain this in another blog post. It usually runs in the price range of $7 to $9 (depending on where it is purchased). There are usually lots of coupons available in the newspaper inserts for Aveeno products. This product comes in a flexible, flip cap bottle which makes it very convenient for travel. The lotion is a crème or beige color and has a nice consistency (not watery and not too thick). Aveeno Active Naturals Skin Relief Calming Lotion, with cooling action smells strange. The best way to describe the scent is maybe mint like or medicine-like. I wouldn’t describe the scent as anything remotely fragrant and I am not exactly thrilled by it. The product does contain menthol, so this might explain the peculiar scent. I am not an avid user of Aveeno Active Naturals products. Although it is called “Active Naturals”, I don’t consider this to be a natural product per se. It does contain a few natural ingredients, such as Shea butter and oat extracts. I have tried Aveeno Active Naturals Anti-Itch Cream with 1% hydrocortisone and experienced good results, though. As far as this product goes, I have a mixed view on it. According to the information on the bottle, this lotion is steroid free and provides “immediate and lasting moisture relief for itch, extra-dry skin. The thing that I like about this product is that it is not greasy feeling at all and it absorbs into the skin fast. The lotion immediately gives a cooling, soothing sensation after application. I think that it provides adequate moisture to normal to moderately dry skin. So it works very well on most of my body. However, anyone who is a regular reader of this blog is aware that I have severely dry skin on my hands. The skin condition has not been officially diagnosed by a dermatologist, but I suspect that I have either eczema of the hands or contact dermatitis. When I apply this product to my hands, there is a definite relief of the dryness and itchiness, but it is very short lived. It is as if the lotion is sucked in quickly by the skin cells and then 15 minutes later, my skin is very dry again. So, I can’t recommend the product for people whom have extremely dry skin. I doubt that this product would help with itchiness due to allergies, but I am not an expert. If your problems are that severe, then it is best to see a dermatologist for a prescription. The product is dermatologist tested, but I haven’t seen any information that suggests that it is hypoallergenic. It contains petrolatum, so it isn’t a product that I would put on my acne-prone face. 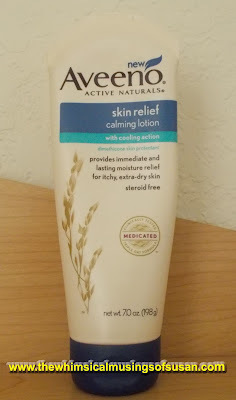 I do think that Aveeno Active Naturals Skin Relief Calming Lotion with Cooling Action can be a good product for persons with normal skin. That’s if you can deal with the weird scent.